Sad times in southern Nevada. The time-honored tradition of no-charge parking on the Strip is slowly facing extinction. The MGM properties were the first to announce that they would be installing gates and kiosks at most of their properties. Then Wynn joined in. The Cosmopolitan is the latest resort to start requiring payment. You can still stash your ride at a number of Strip hotels for free, but the dominoes are falling. 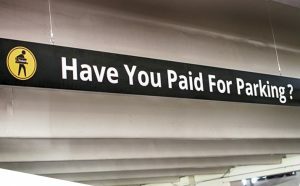 One of these days, no matter how much you fear and loathe it, you will doubtless have to pay to park your car at Circus Circus. There are ways to get around the existing fees, of course, all aided by that huge friend to casino management, personal data gathering. If you use your casino club card to gamble enough, drink enough, eat enough, shop enough, or buy enough entertainment, voila! Your car is welcome to take up a space “gratis” at the Aria or Mandalay Bay. Las Vegas Review-Journal columnist Jane Ann Morrison wrote a whole article about how to get a credit card that will automatically upgrade your status at MGM properties to a high-enough level to receive “complimentary” parking. Yes, they call it complimentary, even though you’re really paying for it. But the truth is, somebody has always been paying for it. I’ve never been a gambler, so before this new switch, I was benefiting from other people’s losses. Now, I’m being charged for not losing the money myself. I guess you could call it fair. Hordes of angry locals see it as anything but. “Greedy corporate bastards” is a phrase I’ve heard more than once. “We’re becoming like everywhere else” is another. That second line is one that actually does worry me, but not because of the new parking fees. I’m more dismayed by national chains with Strip frontage. Do people really come to the Las Vegas Strip to eat at White Castle or Denny’s? Judging from the lines I’ve seen at both establishments, they do. They shop at CVS and Walgreen’s, too. What’s the point of leaving Duluth? 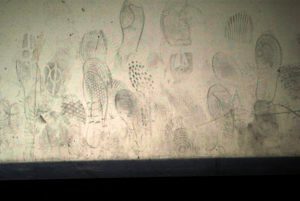 Shoe prints: art or filth? But back to parking. I think one source of local consternation is that the shift to paid parking at Strip resorts heralds the end of an era. It’s going the way of cheap prime rib and generous “comps.” (At some properties, bartenders are already checking gamblers’ accounts to see whether they have earned their next “complimentary” beverage.) Parking fees are also a threat to Strip parking valets. In the days of free parking, valets could count on generous tips. Now that the resorts are charging fees, their tips will undoubtedly shrink. While I do feel empathy for the valets, the new parking fees feel inevitable. They go along with all the other changes that come from higher density and fewer gamblers. Blaming it on corporate greed is too simplistic. Pre-corporate casino owners operated in a Las Vegas that boasted the country’s only casinos. Now that casinos dot the landscape from coast to coast, the revenue streams have adjusted themselves. Vegas resorts no longer exist in their own universe. They have competitors at every turn and around the globe. One thing I have appreciated about the shift in parking rules is that the casinos that now charge have spruced up their parking garages. At MGM properties like New York New York, the elevators no longer smell like the morning after a bachelor party, and a new system of overhead lights lets drivers see where the empty spaces are without driving down a totally occupied aisle. I can’t say I miss the dirty shoe prints on the beams, either. And if I ever change my mind, Circus Circus is (so far) still there to let me relive good old days.